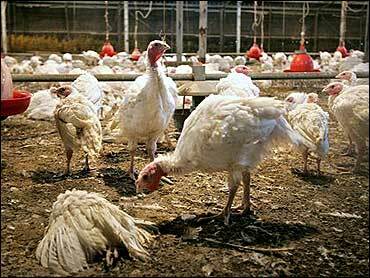 Tens of thousands of turkeys were ordered destroyed Friday as a protective measure, while officials waited to hear whether Israel has experienced its first outbreak of a deadly bird flu. About 11,000 turkeys have died in recent days, and after preliminary tests, Health Minister Yaakov Edri said there was a "very high chance that this is avian flu." "We are already pretty sure it is avian flu, but of course, there are more tests to be done," Edri told Army Radio. The new cases reflected the disease's persistent global spread since outbreaks in eastern Asia in late 2003, with evidence suggesting it is being carried by migratory birds and officials now confirming the virus in the Middle East, Europe and Africa. An Agriculture Ministry spokeswoman, Dafna Yarisca, told The Associated Press it could take anywhere from hours to days until final results were in. No cases of human illness have been reported, Edri said. If the H5N1 strain of avian flu is confirmed, and in the unlikely event it spreads to humans, Israel has vaccinations for half a million of its 7 million people, he said. Israeli media report four people have been hospitalized and are under observation for signs of the flu, but government veterinary officials say it's not likely they actually have bird flu. Vietnam has intensified a crackdown on poultry smuggled from China to help prevent bird flu flare-ups, officials said Friday. Agriculture Minister Cao Duc Phat sent a telegram on Thursday ordering all border provinces and relevant ministries to work harder to keep Chinese birds from illegally entering the country. Lab tests have confirmed the first outbreak of the deadly H5N1 strain of bird flu in war-ravaged Afghanistan, the United Nations and the government said Thursday. A joint U.N.-Afghan statement said samples taken from six birds in the capital, Kabul, and the eastern city of Jalalabad tested positive for the virus, raising concern about how the impoverished Central Asian nation's government will deal with an outbreak of the disease. In western India, health workers trying to stamp out a second outbreak of bird flu searched through backyards and struggled to convince anxious villagers that their chickens must be slaughtered. India's first outbreak last month of H5N1 bird flu was centered in large poultry farms. But the latest outbreak — reported so far only as an H5 virus, with the H5N1 subtype not yet confirmed — has hit small backyard farms, most with less than 20 chickens. "This time it's more difficult because teams have to find out if there are chickens in people's homes," state animal husbandry official S.M. Ali said. Pakistan, which shares borders with all three infected countries but has yet to report a confirmed case of H5N1 bird flu, sent fresh samples of diseased chickens this week to London for testing, government official Muhammad Afzal said Thursday. Last month, authorities sent samples from the same two farms in the country's northwest for tests, but the results were inconclusive. Denmark on Thursday became the latest of 19 European countries to report cases of the virus, with its Ministry for Consumer and Family Affairs saying tests showed that a buzzard found southwest of Copenhagen was carrying the disease. Bird flu has ravaged poultry populations and also spread to people, killing at least 98 people since 2003, according to the World Health Organization. That tally does not include three human deaths reported this week by the Caucasus nation of Azerbaijan. Three people admitted to a southern hospital were being observed for signs of bird flu, a spokesman at Soroka Medical Center in Beer Sheva said, but Israeli veterinary officials said they did not think the patients had contracted the disease. A fourth person who could have contracted the disease was put in isolation at the Barzilai Hospital, a hospital spokeswoman said. The man worked in the southern town of Sde Moshe, a fourth area where birds are suspected of having contracted the flu, the spokeswoman said. Health officials fear H5N1 could evolve into a virus that can be transmitted easily between people and become a global pandemic, but there has been no confirmation of this happening yet. At least 97 people have died from the disease worldwide, with most victims infected directly by sick birds. The suspected outbreak originally was centered on the Negev Desert farming communities of Ein Hashlosha and Holit, but later spread to Nachson, a farming community near Jerusalem, Agriculture Ministry officials said. Officials imposed quarantines in all three areas, and on Friday, ordered turkey flocks in all three communities destroyed, the Agriculture Ministry said. Dr. Shimon Perk, head of the Agriculture Ministry's poultry disease department, said he expected 86,000 birds to be destroyed within two to three days. The Haaretz newspaper reported on its Web site Friday that a fourth flock in Sde Moshe, near the southern town of Kiryat Gat, was also under observation. Four million units of flu vaccine for birds were ordered protectively from Holland, Agriculture Minister Zeev Boim told Israel Radio. Ein Hashlosha is about one mile from central Gaza, and Holit is 9 miles to the southwest, about one mile from southern Gaza. Yarisca said Israel, in cooperation with the Palestinian Authority, regularly tests chickens from Gaza for avian flu, and so far, the flocks there have aroused no cause for concern. The H5N1 virus was detected in neighboring Egypt last month, and Boim said Thursday that the death of the birds in southern Israel might indicate the disease entered Israel from Egypt. The H5N1 strain has killed or forced the slaughter of tens of millions of chickens and ducks across Asia since 2003, and recently spread to Europe, Africa and the Middle East. Officials said there was no danger of infection from eating cooked chicken, turkey or eggs.